While Sasha chops apart one of the pews, Daryl and Tyreese quickly comment on her mental state. Gabriel stands saddened that his church is being dismantled and set up for protection. Rick struggles with Carl’s desire to go to save Carol in Atlanta, so Michonne offers to let them both stay and she will go instead. Rick turns down the offer and convinces Carl to stay behind, leaving Gabriel, Carl, Michonne, and Judith to finish up their fortification of their stronghold. Gabriel walks away from the banging, but it slowly starts to drive him insane. He frantically scratches at some stains he sees on the floor, almost turning his fingers bloody, but just spits in his hand and continues to try to rub out the blood. Speeding back to Atlanta in Daryl’s stolen truck, Tyreese tries to talk to Sasha, but she refuses to even begin to listen. Back in the hospital, Beth walks into Carol’s room to check on her when she is interrupted by Dr. Edwards. Out on the road, the group waits to see if Eugene will actually wake up from the beating Abraham delivered to him. The group debates their options while Abraham sits in silence off to the side. When Rosita attempts to give him water, he snaps at her and stands threateningly over them. Rick provides the plan to the group as they get ready to storm the hospital. Tyreese is clearly tentative about using force and raises his objection. Rick acknowledges that attempting to negotiate would possibly work, but he feels the need to take the quiet offensive and guarantee their recovery of Carol and Beth. Daryl tries to play the middle but Rick appears to be dead set on his plan. As Gabriel continues to clean the floor, Carl tries to give him a gun. Gabriel expresses his discomfort with the situation and all of the violence. Carl gives a short speech about safety and the need to stay on the move. Staying mobile keeps you alive. Gabriel starts to select one of the blades from the weapons, but he immediately feels sick and announces that he needs to go lay down. Dawn talks with one of her officers about the search for Noah. Dawn demands that they need to get it done to bring him back. The officer immediately turns his attention to Carol and his desire to pull her life support to save energy. Dawn initially entertains the comment but Beth intervenes to try to advocate for Carol’s life. The officer gets angry, which forces Dawn to side with him. After her leaves, Dawn tells Beth that it is her job to save Carol and gives her a key to their truck. On the road, Rosita, Glenn, and Tara go out for supplies while Maggie and Abraham stay with Eugene’s comatose body. While the search party discusses the merits of Eugene’s lies, Maggie grabs the ladder off of the fire engine and props it up on the truck, laying a blanket over top and giving Eugene’s body some shade. She walks over to Abraham and demands that he get over his ego and grow up. Beth goes to visit Edwards in his room and asks about how to save Carol’s life. Edwards gets a sense that Beth might be trying to pull something, but he eventually tells her what to get (epinephrine) and wishes her luck with her mission. Having gotten to the stream, they get their water, but Rosita rips a piece of her shirt off to create a filter to clear the water. She talks about her meeting with Abraham in Dallas and how he asked for her help and to join him in his travels. Glenn spots some ripples in the water and guesses that there are fish to catch. In Atlanta, Noah fires off some shots while the police chase the direction of the noise. They catch him but are ambushed by Rick’s team. The one officer guesses that Rick used to be a cop, but then they are ambushed by another set of officers. Rick is able to take out one of the car’s tires before they turn the corner. The group chases after them and find the car broken down amongst a scattering of napalmed walkers. Daryl splits off to check a part of the area on his own and searches a trailer. Just after clearing it, he is ambushed by one of the officers and is pinned to the ground near two partially-melted walkers. Desperate to free himself, he is able to avoid getting bitten and rips a walker’s head off through the eyes to bludgeon the officer. 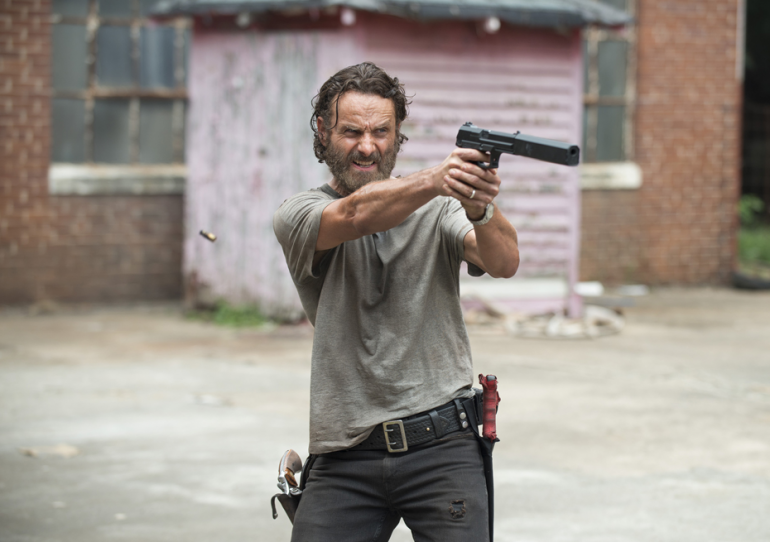 Rick comes to his aid but looks ready to shoot the man in the head. Daryl uses reason to get Rick to stand down and let them take an extra prisoner. The captured officers attempt to plead for a different way, as they claim Rick’s plan as a poor choice. One of the officers takes Rick’s side of the plan but requests to take a more peaceful approach. Glenn takes out a walker as his group continues to scavenge for more supplies. Glenn and Rosita take their makeshift net into the water and are successful at catching their fish. Tara calls over during her search of the bag she found, claiming to find something big. Michonne goes to check on Gabriel, who still seems rattled by their situation. She tries to explain that they only do what they need to survive and save their humanity. She tries to comfort him, but he quietly says thank you and shuts the door. Taking the machete in hand, he continues to pry up floorboards, unbeknown to those outside. Beth devises a plan with one of the wards and sneaks into the medicine cabinet to get the necessary drug. The ward plays the game long enough for Beth to calmly walk away from the scene. She preps the IV drip for Carol and begins to administer the medicine. Speaking to her softly, she tries to make contact with Carol just to give her a sense of hope. Going through the officers’ supplies, Sasha has a moment of anger slip out again, forcing Tyreese to confront her again. She admits that she should have taken care of Bob, but Tyreese comforts her with the fact that he wanted to help her. 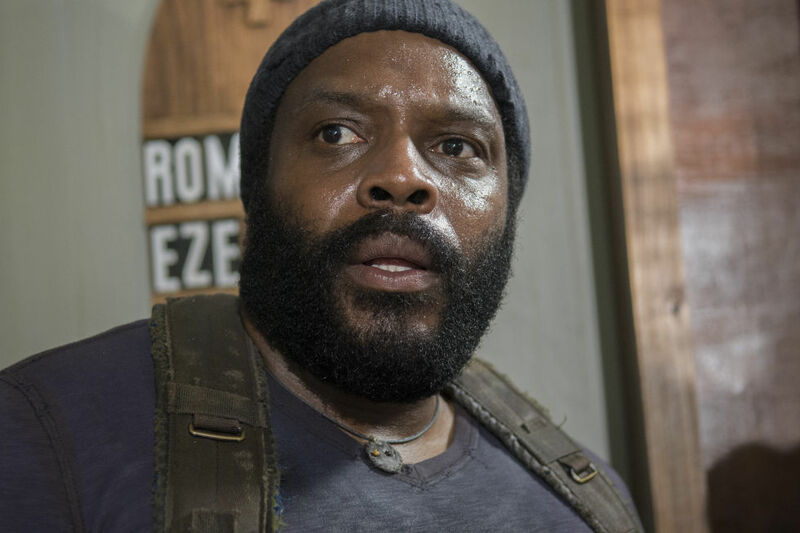 Sasha and Tyreese return to the rest of their group with the supplies and to Rick making some decisions with one of the officers about how to confront Dawn. The officer finally introduces himself as Bob Madison. Sasha goes over to talk to Bob, who explains his story about how he ended up in his situation, having been saved from becoming on of the napalmed walkers. Sasha offers to take out the walker that used to be a friend of his. Gabriel finishes with removing the floorboards and makes an escape out of the church. Just outside of the walls, he steps on a nail, pulls it out and hobbles into the woods. She hears some noises nearby, stops, and gets attacked by a walker. He is able to fight it off and toss it to the ground, but stops short of smashing its head with a rock when he sees the cross. Maggie takes a sip of water and walks over to Abraham to try again to offer him water. She asks if he wanted her to shoot him, but he admits that he did not want to actually die. They hear noises and Maggie realizes that it is Eugene waking up. She runs over to help him while Abraham takes a sip of water finally. Glenn and the others start to make their way back to the fire engine, while he calmly says they will be okay. Sasha takes Bob up to look out toward the body of his former friend. As she lines up the shot, she pulls away to check with him when Bob rushes her into the window. She falls to the floor and he runs off. Reaction: As could be assumed from the episode number, this ended up being the setup for the midseason finale. The group is divided into four different locations and potentially have a chance to finally come back together, but there are some things that will need to happen first. Gabriel continues to be a conflicted Christian, with the evidence of the horrors of this new world all around him and the inner need to maintain his peace and faith. Felling unable to even understand and comprehend Carl’s and Michonne’s attempts at consoling him, he felt his only chance was to get back outside of the church that has since been destroyed both physically and symbolically. While he has only been helpless so far on the show, Gabriel was confronted with a need to save his own life and was at least about to accomplish that task. Paralyzed by his faith, the cross around the walker’s neck prevented him from making the full leap to accepting his fate. Abraham was working through his world breaking again, but his struggle was much more internal. Sasha was avoidant but choosing to join in on the mission, while Abraham tried to completely extract himself mentally from his group. Whether he felt something for what he did to Eugene is still unclear, but he was clearly struggling with Eugene telling him that the mission was for nothing. Rick’s group made some progress to capture a couple of the officers, but there is still much to be done to save Beth and Carol. Dawn seemed to both defy Beth’s desire to save Carol and aid her in the process. There is a lot of uncertainty with who will actually make it out of Atlanta. There is a strong chance that someone will meet their end, but it could be a shocker to actually have everyone survive in one piece as well. Cannot wait for the midseason finale, but also wish the break was not so long before it started up again.